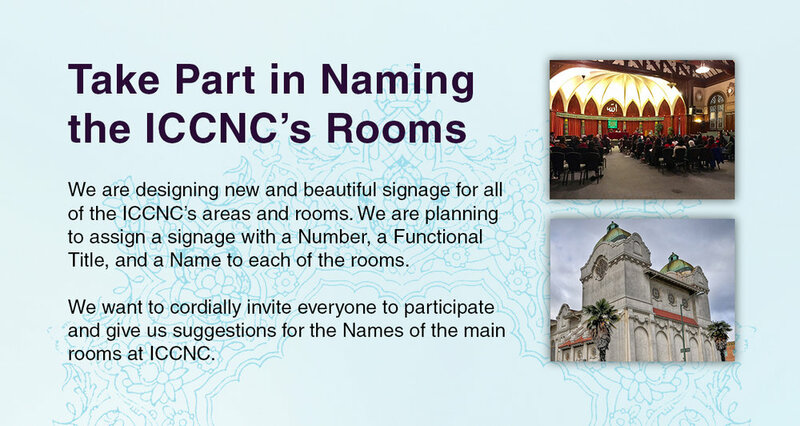 The Board is pleased to announce the ICCNC's "Building Signage and Branding" project through which we are designing new and beautiful signage for all of the Center's areas and rooms. We are planning to assign a signage with a Number, a Functional Title, and a Name to each of the rooms of the Center so that referring to them will be much easier and much more elegant than now (for example Hikmah Library, 302). In order to accomplish this project we want to cordially invite you to participate and give us your suggestions for the Names of the main rooms at the Center by September 15, 2017 by clicking HERE. In this form, you may find 11 rooms with the description of their location and function and you may just type your suggested Name for each of them. We are looking for names that are general, interesting, easy to pronounce in English, possibly having a relevant meaning to the function of the Room, and appealing to our vast community of Iranian/Afghan, Muslims, Immigrants, and the second generation. Your suggestions and opinion are very valuable for us but please note that we can not guarantee that your suggested Names might be selected. A committee including the Board, Designated Body, Building Team, and Public Relation Team will review all the suggested Names and will make the final selection.